greetings from Nashville! played a show in Chicago Friday night…decent little venue, interesting crowd. drove to Wisconsin after & got to spent the weekend hanging there! awesome time off, drank boots at all the cool Madison bars! Sunday we started the drive down South. got to see more of Illinois & Iowa. we decided to check out this roadside attraction called “Snake Alley”…basically its the curviest steepest alley way in America…we’re always down for cheap weird tourist attractions. you know you’ve officially lost your minds when you listen to the same Christmas mix CD on repeat for hours….Monday we kept driving down to Missouri to St. Louis. went to the free zoo there which is apparently rated #1 in the country. loved it! also got to see the St. Louis arch…then further south. Tuesday aka today we just got to Nashville. about to check into the hotel in a little then i’m sure go exploring. here til Thursday morning then show in Johnson City Thursday night! Monday/Tuesday: Canada was pretty interesting…we saw Niagara Falls (beautiful) & found out driving in Toronto is basically the equivalent of driving into NYC aka traffic for days. but the city was still pretty cool, loved Kensington Market & all the vintage shops! Wednesday Oct 17th: Saginaw, Michigan. played a show at the Hamilton Street Pub. cool venue! afterwards we actually got to stay in a hotel! which was exciting cause we usually sleep in the car…I forgot how wonderful beds & showers are! Friday: I’m sitting at a rest stop on top of the highway in Chicago…show tonight at the Elbo Room! looking forward to it! then after that we’re driving to Madison, WI to spend the weekend with one of my best friends. third week of tour coming to an end….home next week. feels so crazy….im not sure I remember how to have a real life haha I guess we’ll see. after an awesome show in Providence, we drove up to Albany. because i’m so lucky, our car battery ended up dying so we had to get it jumped & buy a new one. but oh well! 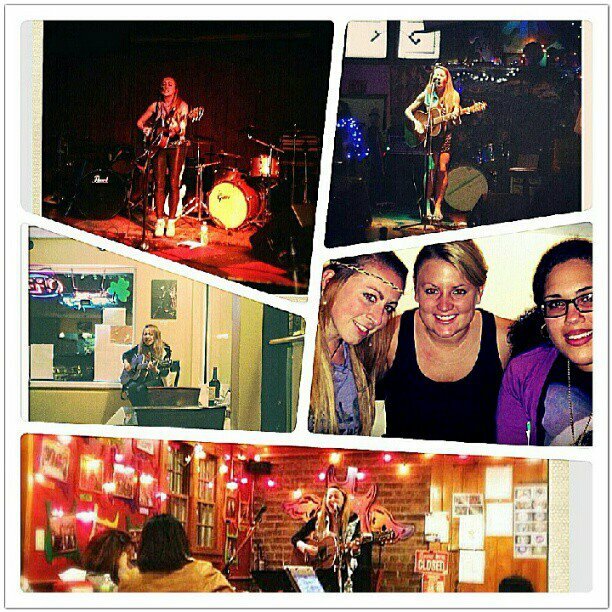 Tuesday played open mic at Emack & Bolios (awesome coffee/icecream/novelty toys shop) & Wednesday McGeary’s Pub. after we decided to stop at a random bar & it turned out to be karaoke night! hilarious & disasterous all at once. Thursday we headed further up to Rochester. played an open mic at Boulder Coffee, met tons of people & gave out lots of CDs 🙂 🙂 Friday I played a show at Abilene Bar & Lounge in downtown Rochester. Saturday I did my first radiosession!! it was for WITR 89.7, RIT’s college radio station. super cool! thanks to my cousin Phil for hooking me up! tomorrow I believe we’ll be venturing up to Canada for a few days! which will be sweet because i’ve never been out of the country. and then its onward to Michigan! conquered Philly October 1st, Brooklyn October 3rd, & West Hartford CT October 4th…its been quite a whirlwind week. the show in Brooklyn was at this really artsy type venue called Goodbye Blue Monday. it had the coolest records and posters and books…the neighborhood was a little sketch buttt we made it out alive and made the drive to Connecticut that night. the next day we pretty much just explored & shopped in CT all day…they had at least 4 pizza shops per block and I spent the whole time pretending I was on Gilmore Girls and looking for all the places on the show hahah. we of course scouted out some great happy hours during the day before the show. the venue was an awesome little pizza cafe called backstage pizza. the weather was absolutely terrible but all the people were super nice & friendly and definitely took care of us. day off today, hanging in Massachusetts with family. went on a great early morning run, the weather is gorgeous this time of year in new england! show tmrw night in Providence, RI at AS220! super excited! If you’re interested in supporting the tour while we’re out on the road, consider purchasing the Tour Diary Demos on bandcamp that I’m selling on tour. Also all of the other music on my bandcamp is for sale as well. kicked off the tour last night at North Star Bar! awesome venue that ive never played at before…did a stripped down totally acoustic set in their victorian dining room. amazing sound! shared the bill with Kwesi Kankham…awesome musician, check him out! packing today & off to Brooklyn tomorrow…playing at Goodbye Blue Monday 1087 Broadway. come hang out!